Valentine’s dinner has such a high degree of potential difficulty: You’d like to wow your beloved, ideally, without spending a fortune and without getting into something too involved and complicated. One year, my husband made lobster thermidor, favorite of Lego Batman. I was appropriately bowled over, and he’s capable of the culinary challenge lobster presents. Me, I’m looking for easy and impressive, two things that usually don’t show up simultaneously. So may I present: Fish in paper. I remembered making this for a long-ago boyfriend, and it couldn’t have been too difficult if twentysomething me, who didn’t cook very much, could pull it off. And you do cook the whole thing in parchment paper hearts, which makes the meal inherently V-Day appropriate. So I pulled out the recipe from my ironically titled Better Homes And Gardens New Cookbook from 1989, making some small tweaks here and there. The thing about cooking fish en papillote is you’re gently steaming the fish in its own juices (along with butter, lemon, aromatics), inside its own cooking vessel. That browned parchment container can be placed directly from oven to serving plate, making for a rustic-looking and impressive presentation. (And if you shape it into a heart, it’s even more romantic!) The whole dish has a high yield-from-effort ratio, and it’s practically foolproof—a 5-6 oz. portion of a firm white-fleshed fish takes about 15 minutes at 350 degrees Fahrenheit. It’s also an easy dish to prepare ahead of time: You make the paper packets in the morning, and when you’re ready to eat at night, just pop ‘em in the oven. Pre-heating the oven takes longer. 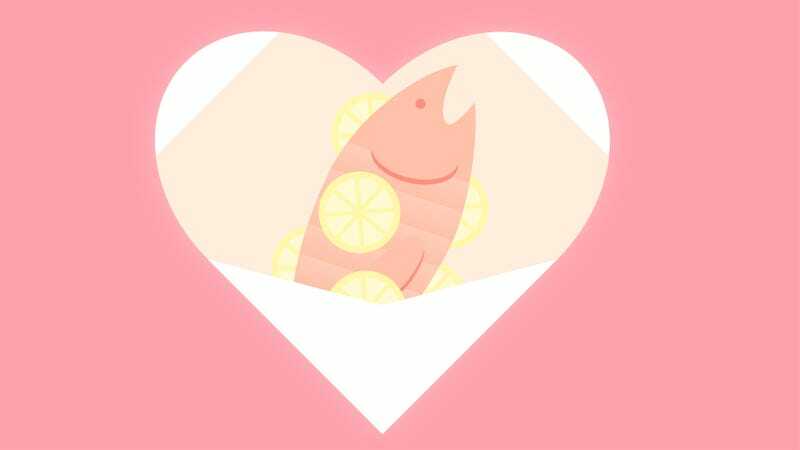 On a recent evening, I made fish en heart-shaped papillote for lobster thermidor guy, and he was impressed. Whether you’re trying to win over a new love or do something nice for your longtime partner, that person doesn’t have to know how easy this was to pull off (honestly, depending on how crafty you are, the hardest part may be keeping the parchment paper from rolling while you’re trying to cut it). It’ll just be our Valentine’s Day secret, okay?